DOES EVERYTHING IN LIFE HAPPEN PURELY BY CHANCE? OR ARE WE GUIDED TOWARDS PEOPLE WHO CAN HELP US IN OUR HOUR OF NEED? Following the sudden death of her beloved mother, Jessica Gibson’s world falls apart. But after meeting a man who seems heaven-sent, she starts to feel she has something to live for again, and soon discovers that their connection holds far more significance than she could ever have imagined. And when Jessica strikes an unlikely bond with Alexandra Green, the two new friends are taken on an emotional journey into the world of the supernatural, where psychic mediums pass on messages from beyond the grave. What — or who — is causing the strange goings-on in Alex’s home? What secret is she keeping from Jessica? And who is the young woman who so badly needs their help? In a series of surprising twists and turns, the pieces of the puzzle finally fall into place and a mystery is unwittingly solved — with life-changing consequences for all involved. ‘Out of the Darkness’ is an uplifting tale of friendship and redemption; of love and loss. And life…after death. Wow! What an emotional roller-coaster of a read Out Of The Darkness has been. Katy Hogan very kindly sent me a beautiful paperback copy of this book, a fair while ago now (thank you again, Katy), and I can’t believe it’s taken me so long to get around to reading it. I know a lot of my lovely book blogger friends have read and loved this book so I knew I was in for a treat. It’s such a beautifully written, powerful story which captivated me from the very first page. I was completely immersed in the story from beginning to end. When Jessica meets Finn, she is instantly drawn to him and is at ease in his company. After spending the night together, Jessica feels like maybe life will be worth living again after all. Could he be what she needs to move on with her life? When she doesn’t hear from him again though, it seems the connection they seem to have made didn’t mean as much to him as it did to her and she begins to accept that she was just a one night stand to him. She is feeling more positive though and even goes to a grief counselling group, albeit very reluctantly at first. Here she meets Hannah, who seems completely lost also. Soon after she makes friends with Alex, who has moved into the house next door to the one where her group meet. Before very long at all, they become very close friends, but none of them could know at the time, just how closely linked they really are. Such a beautiful, heart-wrenching, but also uplifting story. I have cried so much I could barely see the words at times! Just amazing! This is a book I will never forget and I will highly recommend. I’m so looking forward to whatever Katy Hogan writes next. Having grown up with a mother who consulted her tarot cards on a weekly basis, and who would frequently sense an other-worldly presence, it has always been perfectly natural for me to assume that there is more to this life than meets the eye. I have even experienced a few mysterious encounters myself. But it was only when I suffered the loss of a loved one that I started to question the possibility of life after death, and decided to find out more. And so began a fascinating quest, where I met ‘ordinary’ people who claimed to have experienced the extraordinary. This is where I found the inspiration for my debut novel, ‘Out of the Darkness’. Although it’s fiction, much of the phenomena written about in the story have been experienced by me, my friends or people I spoke to during my research. I have started work on my second novel, but when I’m not writing, you will find me keeping tabs on my teenage children or walking my dogs in the Hertfordshire countryside. 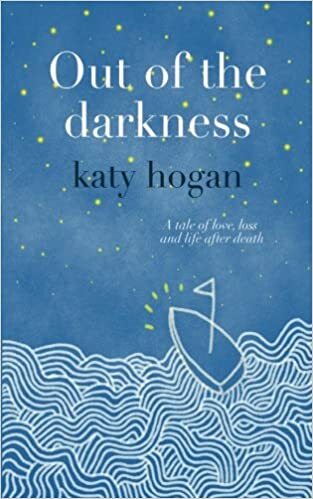 Check out the book, Out of the Darkness, by Katy Hogan, as featured on the Chat About Books blog.